Worsening climate conditions directly threaten prospects for attaining the Sustainable Development Goals (SDGs), and with them the conditions for peaceful societies. As the Paris Agreement comes into force on 4 November, the world will be committed to the best existing global strategy for limiting and reversing climate change. Advancing sustainable development and peace will require bold climate action that looks beyond short-term political constraints. ‘Sustaining peace,’ which recognises the comprehensive social, political and economic factors that contribute to conflict prevention and maintenance of peaceful societies, has become a cornerstone for current peacebuilding thinking. ‘How can we avoid conditions that can lead to conflict in the first place?’ asked Juan José Gómez Camacho, Permanent Representative of Mexico to the United Nations (UN), during a meeting on sustaining peace and preventing conflict on 22 September. While the UN often cites the SDGs as a powerful tool for achieving these conditions, climate action and the Paris Agreement to limit the global temperatures temperature rise to below two degrees Celsius have so far remained on the periphery of the discourse on sustaining peace. 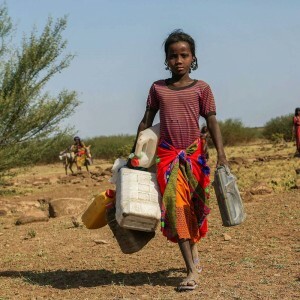 In 2015, the UN conducted a Peacebuilding Review, which noted that climate change is a driver of conflict, and also underlined limitations in the understanding of links between climate and fragility. By expanding the perspective of conflict prevention to include the holistic maintenance of environments that are conducive to peace, the UN linked building safe and peaceful societies to the full spectrum of SDGs. Given the significant threat that climate change poses to African developmental gains, efforts on sustaining peace require responses to rising global temperatures. Climate change directly threatens socio-economic development outcomes. As a 2013 World Bank report outlines, the impacts of climate change are widespread and increasingly severe, with successive degrees of warming beyond pre-industrial levels. For example, a temperature increase of up to two degrees Celsius by the 2050s could reduce total crop production in sub-Saharan Africa by 10%, with further warming increasing the potential loss to around 15 to 20%. These reductions correspond to potential increases in hyper-arid and arid areas across the continent, especially in southern Africa. Reduced water access will dramatically affect both food security and livelihoods, not least because agriculture is predicted to remain the employer of 46% of Africans by 2020. Warming is also forecast to increase undernourishment and the prevalence of diseases, such as malaria, which may hinder childhood education. Climate change will impact the social, political and economic landscape of the continent, and with it the potential to achieve the SDGs and conditions for sustaining peace. The dual UN resolutions highlight the SDG priorities of ‘sustainable economic growth’ and ‘poverty eradication’ as important for sustaining peace – both of which are threatened by climate change. As outlined in a paper by Health and Environment International Trust researcher Tord Kjellstrom, the physical and mental stresses of exacerbated heat exposure negatively impact working capacity around the world. Correspondingly, it inhibits countries’ ability to achieve sustainable economic growth. For example, using the Climate Vulnerability Monitor, Kjellstrom notes that Ghana and Nigeria’s 2030 projections have total climate change costs amounting to 8.9% and 7.6% of GDP respectively. While workplace-cooling schemes may be used to alleviate these losses, recommendations maintain that the ‘global mitigation of climate change’ is the most effective means of protecting health and economic progress. Climate shifts disproportionally impact vulnerable populations, often with limited government support. ‘There won’t be durable peace unless people can enjoy the benefits of development,’ Miguel Ruiz Cabañas, Undersecretary for Multilateral Affairs and Human Rights at the Ministry of Foreign Affairs of Mexico, said at the 22 September UN meeting. Anticipating increasing climate changes, the UN has prioritised resilience-building strategies that seek to sustain peace by preparing communities for climate shocks and increased resource stresses. If successful, improved resilience may better insulate vulnerable populations against excessively negative climate impacts that could contribute to a breakdown of peaceful social relations. Despite the link between conditions for sustaining peace and climate change, action to improve these conditions is far from assured. Proactive strategies will help people manage climate change peacefully. But proponents of sustaining peace must also look beyond improved anticipation and preparation toward advancing the necessary changes in energy production and consumption to keep global temperatures well below the two degrees stated in the Paris Agreement. Encouraging politicians and businesses to invest in climate action to sustain peace over the longer-term can be difficult. ‘We live in a world that has become highly enamoured and driven by short-term gains and short-term returns,’ explained Macharia Kamau, who holds the three positions of Permanent Representative of Kenya to the UN, Peacebuilding Commission Chairperson, and UN Special Envoy on El Niño and Climate. Lacking incentive to think beyond current election or business cycles may lie at the heart of abbreviated timelines for investment and policy action on issues like climate change and conflict prevention. But this does not make the shift in thinking any less necessary. During numerous meetings at the UN General Assembly this September, senior diplomats and UN officials emphasised the emergence of a proactive mindset associated with the adoption of Agenda 2030 and the sustaining peace resolutions. This prioritises reimagining the UN’s role as less of a crisis response unit, and more of a pre-emptive long-term planner for crisis aversion. Mexico’s establishment of a Group of Friends on Sustaining Peace, which currently includes 30 UN member states with four from Africa, is a good step toward galvanising and normalising long-term, comprehensive thinking for sustaining peace. But more political momentum is certainly necessary. As the Paris Agreement comes into force with over 55 ratifications (only 16 from Africa) representing over 55% of global emissions, this broad-based political momentum must be harnessed to highlight the links between climate action and conflict prevention. ‘Action and implementation’ of the Paris Agreement commitments is the stated objective of this November’s COP22 meeting in Marrakech, Morocco. Action on climate change will require looking boldly past immediate political and economic costs in favour of long-term stability, developmental dividends, and conditions for peace. In the short term, countries may see the economic rationale for immediate investment in climate action, but countries should also realise and act upon the opportunity this provides for sustaining peace. This piece was written as part of an ongoing partnership with adelphi, and adapted from its original publication in the Resilience Compass Blog.